Here comes a very sweet and rare pic from Megastar family. In the picture, we can see power star Pawan Kalyan daughter tying rakhi to her big brother Ram charan tej. In the pic, we can also witness Pawan Kalyan’s third wife Anna Lezhneva in traditional saree accompanying her daughter polena. On the auspicious occasion of Raksha Bandhan, Pawan’s cute daughter polena tied rakhi to mega power star Ram charan. Every year ram charan celebrated rakhi festival with his two sisters Sushmita and Srija. But this year a cute little sister has entered in the mega family, she is none other than our own power star Pawan Kalyan daughter polena. 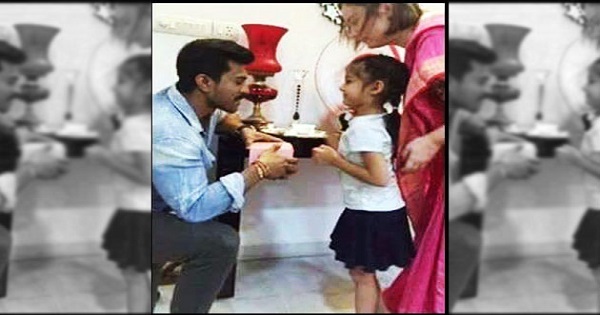 Ram charan has shared his cute moment with his younger sister polena tying rakhi on social media. In the picture, we can see ram charan presenting a gift to Pawan Kalyan’s daughter polena. We all know that Pawan Kalyan is living away from mega family and rarely makes the presence with the family members. But Pawan’s third wife Anna Lezhneva is always actively participating in the mega family celebrations. Recently we can see Anna Lezhneva pics at Mega star’s daughter srija’s wedding celebrations. Pawan Kalyan kids from 2nd wife Renu Desai Akira Nandan and Aadhya are already known to the mega fans but only a few know about Pawan’s third wife Anna Lezhneva and his younger daughter polena. Check her the latest of pic of Pawan Kalyan daughter polena tying rakhi to ram charan.